The beacon ion Hartlepool’s Headland has been lit for the first time in nearly 20 years - to mark the 100th anniversary of the end of the First World War. The beacon at Seaton Carew was also lit as the two communities joined towns and villages all over the country to mark the centenary of Armistice. 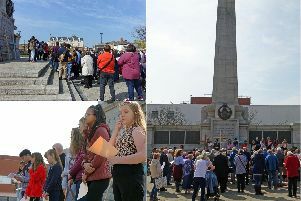 Hundreds of people joined in a parade from the Heugh Battery Museum to the Town Moor beacon as the community gathered to remember our fallen soldiers. Deputy Mayor, Councillor Rob Cook welcomed the crowds and spoke of the devastating night of December 16, 1914 where Hartlepool was bombarded by The German navy in a raid which killed 137 people. But he also spoke of the spirit of Hartlepool which saw more raised for the war effort than anywhere else in the country. The “County Borough of Hartlepool” raised £13,644,415 for the war effort in the 4½ years between September 1914 and April 1919, the most per head of anywhere in the United Kingdom. His speech was followed by a rendition of the Last Post by Yvonne Wood before the beacon was lit in front of the hundreds who had gathered in remembrance. Although it took a few minutes to fully ignite, the beacon of light shone brightly over the dignitaries, military personnel and residents who had turned out for the event. It is the first time the Town Moor beacon has been lit since 2000 to mark the turn of the century. Deputy Lieutenant of County Durham, Sir Ron Norman read ‘A Cry for Peace Around The World’ before a volley of fire from the Heugh Battery Museum was heard. The sounds of the ringing bells from different churches around Hartlepool could also be heard as the beacon shone proudly in Headland. Singer Hattie Eason lead the way in singing the National Anthem to mark the end of the event. Coun Rob Cook said: “Well today has been an absolutely fantastic day to commemorate 100 years since the end of the First World War. “Tonight I think topped it off. We had to wait a little while for the beacon to light but apart from that I think everything went well and people seemed to have enjoyed themselves. Seaton Crew 100th anniversary WW1 beacon lighting. “The last time we lit the beacon was in 2000 and that was to commemorate the new millennium. “It’s only for really special occasions and there couldn’t be anything more special than today. “We have got to remember the people that fought and died or were injured. They fought for our freedom and it is something that we can be proud of to say we have freedom. In an identical ceremony in Seaton Carew, the Mayor of Hartlepool Coun Allan Barclay opened the ceremony before the Last Post was heard. Deputy Lieutenant of County Durham Peter Bowes also read ‘A Cry For Peace Around The World before everyone gathered together to sing songs from the First World War. The beacon at Seaton Carew was lit. The events, which were organised by Hartlepool Borough Council, saw hundreds of people attend.